I discovered a new handle material and just had to put it to use. This is a piece of stabilized Silky Oak from Hawaii. The quarter sawn direction of the cut leaves a mesmerizing appearance to this material that is just extraordinay. Almost needs to be seen in person to be fully appreciated. 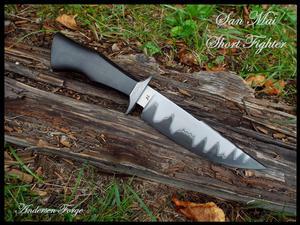 The 7" San Mai blade is made from my mix of 1095V and 420 Stainless Steel. The guard is 416 Stainless Steel and the whole package is a take-down affair so the new owner can actually participate in the on-going 'health' of this beauty. 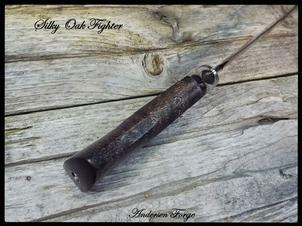 The highly etched guard is made from my stash of 1903 wrought iron. 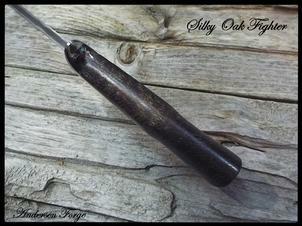 The handle was made from a flawless piece of Gaboon Ebony. 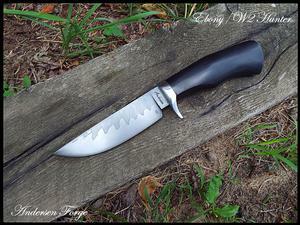 For the first time, on this knife, I created what I might call my finial "cover". Sometimes the stainless socket head on my finials may not necessarily compliment the knife. So, on this one, I covered the assembly access with a piece of ancient Ivory and a heat colored 2-56 screw. Once removed, the take-down procedure is just like all my other knives - ROCK SOLID!!! 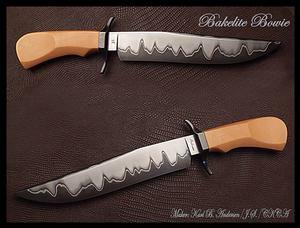 A 1095 and 420 San Mai blade, hot-blued mild steel guard and Bakelite. Seriously, does it get better? Wow. Pretty special knife here. 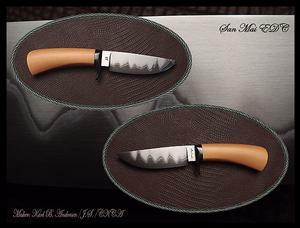 The 1095 and 420 stainless San Mai blade was mated up with a faceted hot-blued mild steel "S" guard and some of my private (and dwindling!) stash of early 20th century Bakelite. Some of the early and original example of the world's first "plastic". 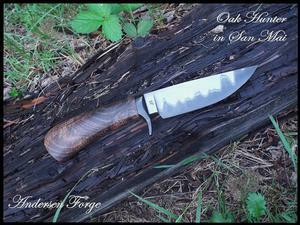 Sold to an incredibly good supporting customer of Andersen Forge. 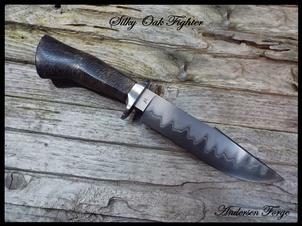 Just a sweet, straight-up W2 Hunter with an exceptional Gaboon Ebony handle. 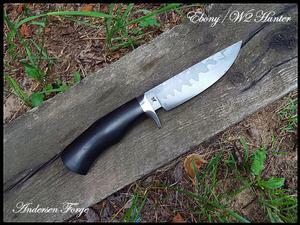 This knife just floats in the hand and begs to cut something!!!! 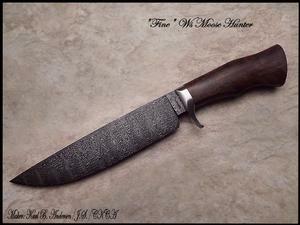 Really nice hamon on the W2 tool steel blade. 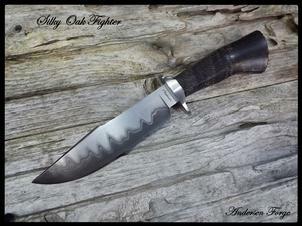 Flawless job from Nature on the Ebony handle. 416 Stainless was used for the take-down hardware in the assembly process. I can't ask more from my knives than to all come out like this. 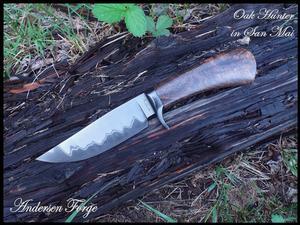 A good customer in Sweden needed a companion knife for his Andersen Forge Hunter. His request was one to handle the BIG jobs associated with dressing a Moose. something with a little more "reach". 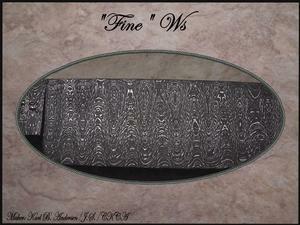 I was also in the mood to make some high-layer count Crushed and laddered Ws style Damascus. So, the two of us came up with this sweet heart. I'm proud to post it here and to send it to my friend. Another beauty from the Land of 10,000 Lakes! 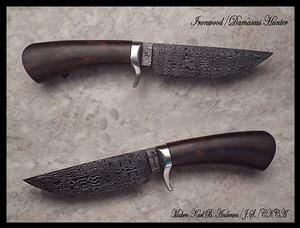 A laddered Ws Damascus blade was hot-blued and mated up with a really beautiful piece of Desert Ironwood. 416 stainless steel guard and made in my signature take-down method. Just oak - you say?? 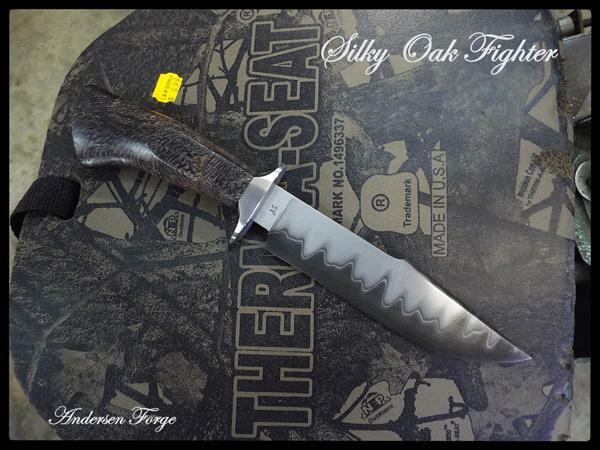 Tell you what, when I saw this stabilized oak for sale on Alpha Knife Supply, I just had to have it. And I'm glad I got it. It is just truly spectacular! So much character in a simple piece of oak that I am still amazed. In fact, I liked it so much after using it here, I ordered the only other piece they had that I couls use. 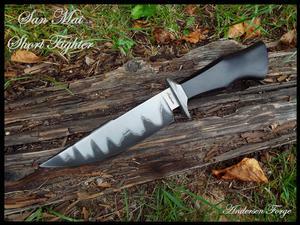 The San Mai Hunter blade is made from 1095 tool steel and 420 Stainless steel. The mild steel guard has been hot-blued. All in all, just a really pleasing knife to build. One of those knives that seems to come along every now and then for me, in which all the components just fit together almost by thenselves! The Damascus, which appears to be "laddered" by traditional means of cutting or grinding, was created with the drawning dies of my press. This type of manipulation brings about a ladder that I prefer, but I'm not always successful in doing. In this case - I was successful! As well, the handle is one in a thousand. Just a magnificant piece of crotch walnut that walks and talks all by itself. I hope you enjoy the view as much as I did making it.